With the help of an ongoing parody of him on “Saturday Night Live” and a host of high-profile exchanges with real-life reporters, White House Press Secretary Sean Spicer has transformed the role. To most people the names Josh Earnest, Jay Carney, and Robert Gibbs don’t mean much, though the three men all recently held the same position as Sean Spicer: White House press secretary. Traditionally, White House press secretary is a highly visible job, but also a relatively anonymous one. The person sitting at home in Braintree may have recognized the faces of the first three as belonging to the president’s chief spokesmen but have no clue to their names. Not Spicer. 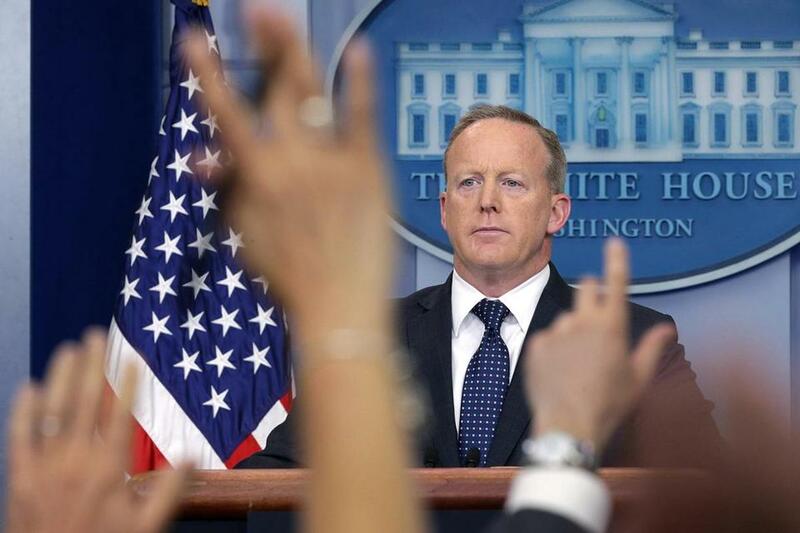 With the help of an ongoing parody of him on “Saturday Night Live” and a host of high-profile exchanges with real-life reporters, Spicer has transformed the role of press secretary. He now has higher name recognition than most US senators. This is why the news Monday night that Spicer is leading the search for his own replacement was more than just some Washington story. It is a cultural moment of sorts. After all, Spicer is not only a celebrity, but Trump’s most public punching bag and a player in the country’s larger debate about truth and facts. During the White House press briefing Tuesday, Spicer noted that he was still the press secretary, but that there are some staffing positions in flux. Spicer wasn’t always so well known. In the past, he was a respected Republican Beltway spokesman and strategist. That changed, however, his second day on the job. As he held his first press briefing, he showed pictures of the inauguration crowd and angrily insisted the crowd was larger than it actually was. It was an inauspicious beginning. Time and time again, Spicer has been the one who has been asked to explain statements and tweets from President Trump that have been nearly impossible to reconcile, especially when they contradict the official White House message. Part of Spicer’s celebrity is due to how Trump sees the job. Instead of being the trusted public, nameless face of the administration, the press secretary has taken the spotlight -- and Trump appreciates it. He once bragged that Spicer got good ratings so he must be doing a good job. That Spicer is still around and able to potentially name a successor seems to be an accomplishment itself. Several times it has been suggested that he was about to get fired. Indeed, just last month it appeared that Deputy White House Press Secretary Sarah Huckabee Sanders was auditioning to take over the job when she began doing the televised press briefings. Who knows what the future may hold for Spicer or for his replacement? Spicer might go down in history as a major figure in the wild early days of the Trump White House, or he may just be the first in a string of White House press secretaries -- who take center stage and win a strange new kind of celebrity.